Below are Box Office Collection Report of bollywood film 'Jab Harry Met Sejal' With his review, budget and total box office and worldwide collection status. Jab Harry Met Sejal movie lead star cast is Shah Rukh Khan, Anushka Sharma. Jab Harry Met Sejal is an indian Drama, Romantic Film of 2017, directed by Imtiaz Ali & produced by Gauri Khan. Jab Harry Met Sejal film Released in over 3300+ screens in india. The film had an opening of Rs 15.25 crores, which is lesser than the 1st opening day collection made by Raees ( Rs 20.42 crore). However, it is expected to earn more in the coming days. 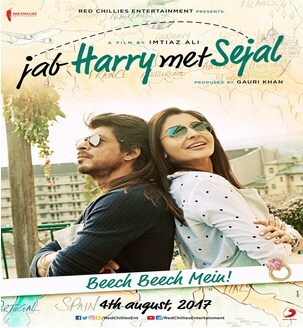 Jab Harry Met Sejal has not opened to great reviews, however viewers have had mixed reactions to this film. Shah Rukh Khan playing the romantic hero once again. Throughout 2016, we had seen him as a psychologist, a VFX-ed 19-year-old Delhi boy and earlier in 2017 as a gangster. (3) I'm big fan of SRK and shah rukh khan and anushka sharma acting is so good but story not good. (5) A movie which you will watch with a smile even from the beginning, the chemistry make us fall in love with them and with the brilliant direction of imtiaz Ali you know this film is great.